A Camera Scanning system consists of several elements, a digital camera, close-up lens, camera support, and something to hold the photo. These can be inexpensive home-made devices, or they can be specialized tools. When copying prints, it is generally best to use the highest resolution camera that you have available, depending on your intended use of the images. If images will only be used for web, significantly less resolution is needed than if the images are intended to be used for print. A copy stand (Figure 1) is a helpful tool for creating copies of prints, since it holds the camera still, and parallel to the print. The stand helps to produce a sharp capture and with proper focus and 'squared-up' corners (Figure 2 - shows squared and trapezoid representations). While a tripod may be used instead of a copy stand, it is often less ideal for several reasons. Because the support column on a copy stand is mounted perpendicular to the base, it is easier to get the camera parallel to the print. Additionally, a copy stand typically offers unobstructed vertical travel for the camera, while a tripod typically has a more limited range of vertical adjustment without also readjusting the legs. Finally, the tripod legs can cast unwanted shadows on the print. Lighting for copy work is most often provided by a pair of lights on either side of the print, set at a 45 degree angle of incidence, as shown in Figure 1 above. This offers minimal reflection from the print's surface, as well as side-to-side evenness. Sometimes polarizing filters are used on the lighting, in conjunction with a polarizing filter on the camera lens in order to reduce reflection caused by texture in the print's surface. The colour of the light source is also important, particularly for reproduction of color images. While digital cameras can be adjusted to compensate for the very red light of tungsten bulbs, or for the blue light of open shade, the camera can do a better job of creating a good colour reproduction if the light source is a traditional 'Daylight' balance. This is also referred to as 5500 degrees kelvin. This colour light can be provided most economically by using daylight-balanced compact Fluorescent tubes, such as the Cool-Flo. 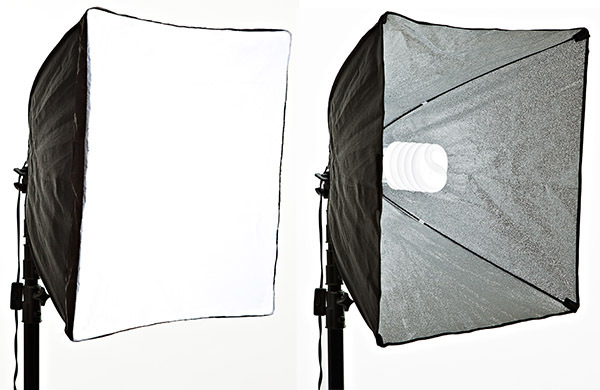 Strobes can also be used to achieve a daylight balance. For maximum accuracy in print copying, it is best to create a custom white balance for the camera. If you are shooting raw, and if the software you use supports a custom profile, you may find using a custom profile helpful. This custom profile can compensate for the imperfections of your particular camera, and can streamline the process of image optimization. Creating camera scans from film is a more involved process than print copying, but the payoff can be even greater once the system has been configured. The result is a first-generation copy that will generally include more information than a copy of a print. And since film libraries contain many originals of the same size, it is possible to scan many thousands of images without having to readjust for size. 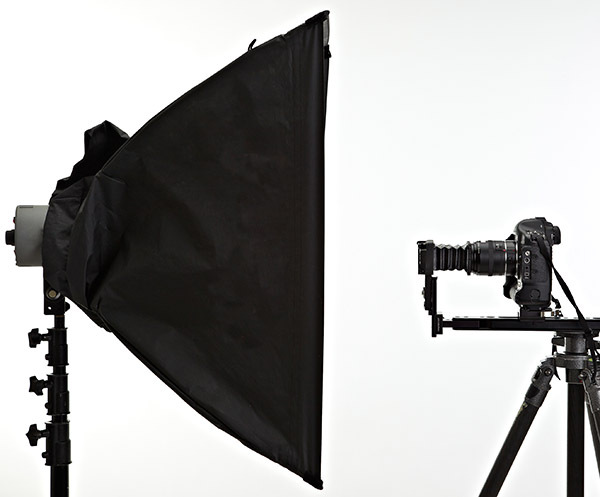 A camera scan setup for film will have five elements - the camera, a closeup lens, a film stage, something to connect the film stage and the camera, and a light source. There are 5 basic types of film scanning systems. The movie in Figure 5 discusses the considerations of each. A Bench system, such as the Bessler Dual Mode Slide duplicator, is a self-contained system with a light source, a film stage, a camera mount and lens bellows in a single system. As of this writing, there are no bench systems that are currently being manufactured, although there are many used systems available on the resale market. Bench systems are reasonably easy to configure as a do-it-yourself project. 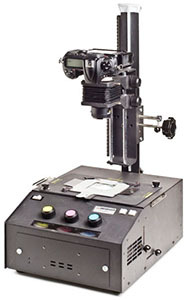 Other options for bench systems include the Kenro Spectra 1000 and the Omega ChromaPro slide duplication. The popular Bowens Illumitran unit generally does not fit a digital camera body. 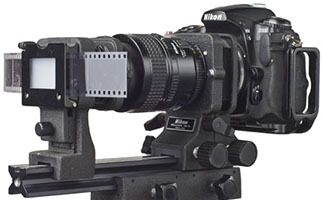 A lens-mounted system connects the film stage to the closeup lens itself. There are several commercial lens-mounted systems that are currently in production, but they suffer from several drawbacks. they tend to put a lot of stress on the moving parts in a camera lens, which can lead to failure of the lens. 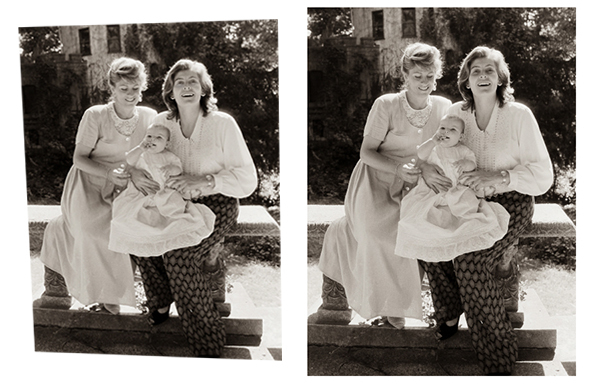 Additionally, they are typically not rigidly supported, so that the negative is not in the same exact location in each shot, which leads to a more difficult cropping of a multiple images. Bellows systems have been in use for decades as slide copiers. 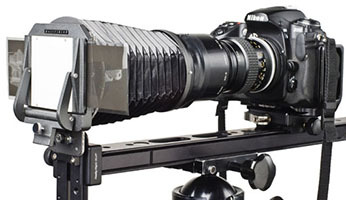 Typically, there are 3 movable elements, one for the camera and one for the lens that are connected by a bellows, as well as a film stage that is attached to the same rail. 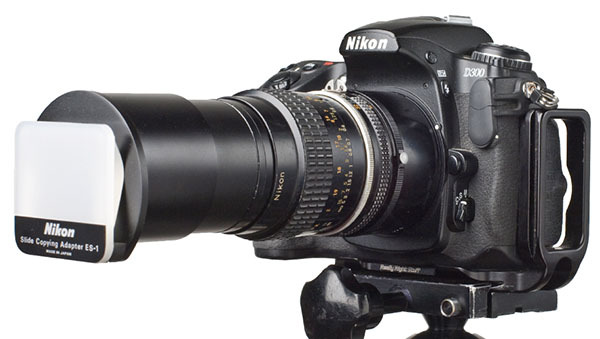 Note that bellows systems will only work for some camera and lens combinations. Crop factor cameras change the lens-to-camera distance, and can prevent the camera from focusing at the proper distance. A good daylight-balanced light source needs to be used to provide illumination. A bellows system offers good workflow and ergonomic freedom, since it can be tripod or stand mounted for comfort. Rail systems are similar to bellows systems, but use a macro lens directly attached to the camera instead of the bellows. A film stage is also mounted on the end of the rail, and some kind of daylight light source must be used just as with the bellows systems. Rail systems typically offer faster workflow than bellows systems because the macro lens provides for full-aperture viewing and automatic stop-down, while most bellows systems require manual aperture opening and closing. Rail systems are also much more flexible and support more camera and lens combinations. A Copystand and Light table system is the do-it-yourself version of the bench system, as pictured in Figure 4. 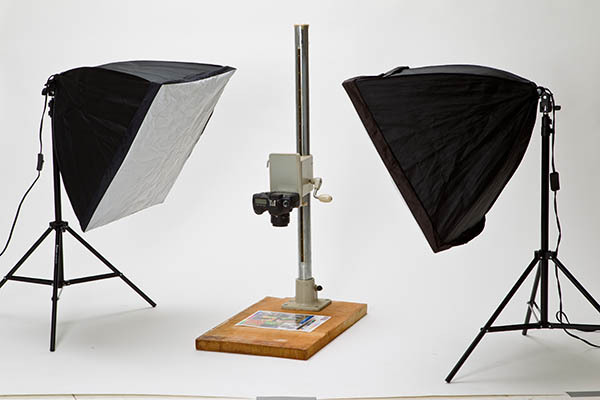 A film holder from an enlarger can be used with a lightbox or other backlight to provide the film stage and lighting. Note that critical focus and image squareness requires the camera to be exactly parallel to the film surface. This is harder to achieve as the film gets smaller, so these systems may be best suited to medium and large format film originals.